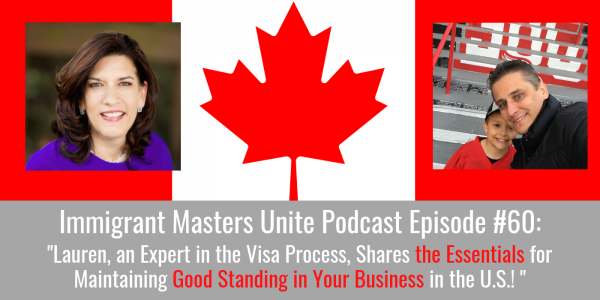 IMU 060: Lauren, an Expert in the Visa Process, Shares the Essentials for Maintaining Good Standing in Your Business in the U.S.! | Immigrant Masters Unite Podcast: Transform Your Business, Life and The World Around You! Are you planning on immigrating into US and/or starting an immigrant-based business in US? Do you know what type of visa to use when immigrating as an entrepreneur? Do you know how to keep your immigrant business in good standing with the United States Gov? This is Polish Peter and welcome to episode 60 of Immigrant Masters Unite. Today, I have Lauren Cohen from Canada. Global entrepreneur and #1 bestselling author, Lauren A. Cohen is an attorney licensed in both the U.S. and Canada. Lauren is an expert concierge immigration and business advisor boasting a stellar track record of success. Lauren has first-hand knowledge of the visa process, having herself immigrated from Canada in 2001, and later becoming an American citizen in 2012. In 2008, Lauren started e-Council Inc., an internationally-acclaimed company focused on providing concierge strategic full-service solutions for businesses seeking capital and foreign entrepreneurs seeking access to the U.S. market. In 2017, Lauren established Israeli Innovation Bridge, whose mission is to build bridges to enable innovative Israeli companies and entrepreneurs to successfully penetrate the North American market by matching Israeli early-stage companies & entrepreneurs with investors, collaborators and strategic partners. Do you know what type of visa to use when immigrant as an entrepreneur? Listen as Lauren discusses the different types of visas you should consider to use when it comes to immigrating into United States as an entrepreneur and/or business owner. Top things to keep in mind when running a business in United States to make sure you are in good standing and can get your visa renewed. What to look for when hiring an attorney to help you with your visa and setting up a company.